Brewer's yeast, one-third of whose genome is said to share ancestry with humans, has 16 chromosomes. However, Chinese scientists have managed to fit nearly all its genetic material into just one chromosome while not affecting the majority of its functions, according to a paper released Thursday on the website of the journal Nature. Qin Zhongjun, a molecular biologist at the Center for Excellence in Molecular Plant Sciences of the Shanghai Institute of Plant Physiology and Ecology under the Chinese Academy of Sciences, and his team used CRISPR-Cas9 genome-editing to create a single-chromosome yeast strain, the paper said. Yeast is a type of eukaryote, which also includes humans, plants, and animals. Humans have 46 chromosomes, whereas male jack jumper ants have just one. It seems that the number of chromosomes of a eukaryote has no correlation with the amount of genetic information they possess, the paper said. "Our research shows that all the genetic information can be concentrated in just one chromosome," Qin said. In the past, researchers had fused two yeast chromosomes together, but no one had ever performed the type of extreme genetic surgery that Qin and his colleagues set out to do several years ago. Using the CRISPR-Cas9, Qin's team removed the DNA at the telomeres, the ends of chromosomes that protect them from degrading. They also snipped out the centromeres, sequences in the middle that are important to DNA replication, the paper said. First, they fused two chromosomes, then joined this product to another chromosome, and repeated the process in successive rounds until there was only one chromosome left, it said. 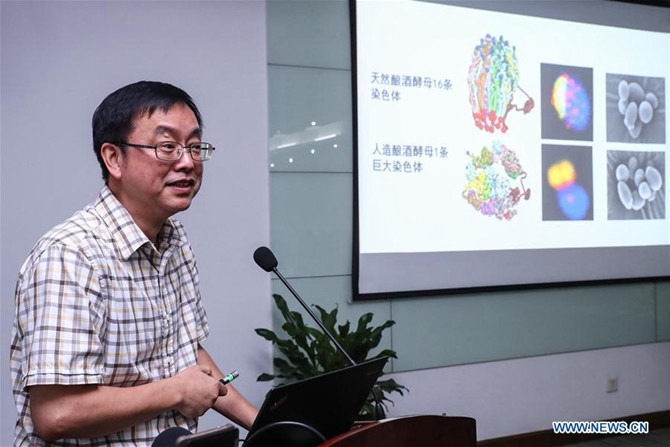 Despite the genetic clipping and restructuring, yeast with one "super-chromosome" is similar to natural yeast in cell growth and gene expression, Qin said. "It overturns the traditional view that gene expression is determined by the structure of chromosomes," he said. By simplifying a complex genome system, Qin suggested that the research provides a new approach to studying the functions of telomeres. Earlier research found that the length of telomeres is related to early aging, the formation of tumors, and other diseases. Telomeres shorten as a cell splits, but if telomeres cannot shorten anymore, the cell dies. "A normal yeast genome has 32 telomeres of various lengths. It is too hard to describe each telomere's changes or reactions to drugs. But with only one chromosome and two telomeres, it will be easier to find the patterns," Qin said. The research may also pave the way for new man-made species in the future. "Yeast has great tolerance in genetic modification, and it is possible to add new chromosome segments to the genome. Researchers can make bolder attempts," he said. According to the paper, the change to the chromosome number has little impact on the gene activity. However, the single-chromosome strain produces fewer spores, which are reproductive cells for non-flowering plants, bacteria, fungi, and algae, in sexual reproduction. "The survival rate of spores produced by a natural yeast strain is 98 percent, while that of ours is 87.5 percent. The gap is not big," Qin said. The paper also said that Jef Boeke, a geneticist at New York University, and his team submitted their outcome for similar research. They condensed the yeast genome into a pair of chromosomes, but could not fuse the pair into one. One explanation for the difference is that Qin's team removed 19 repetitive stretches of DNA. Qin suggested these sequences might have interfered with the mechanism that cells use to fuse two chromosomes into one. The two teams worked independently from each other.